Music in the Key of America Can we find an inspiring theme for next year’s presidential contest? I mean this Thanksgiving column to go from a small fact to what I think a large truth. The small fact is that looking back now on an enjoyable book tour, a surprise was that a lot of people are interested in the specifics of how others work. Early on I was asked in an interview why I listen to movie music when I write, a habit of 25 years. One reason is that I love movie scores and have since childhood: When I didn’t understand all the dialogue the music would make clear what was being said. The other reason is that film scores exist to help the story along; they don’t yank you away from your work, your thought. Other music—an opera, a great Broadway show, an old album you love—intrudes and, with its power, summons you away. But movie music is the river on which the story sails—and all writers, in whatever field or discipline, are telling a story. 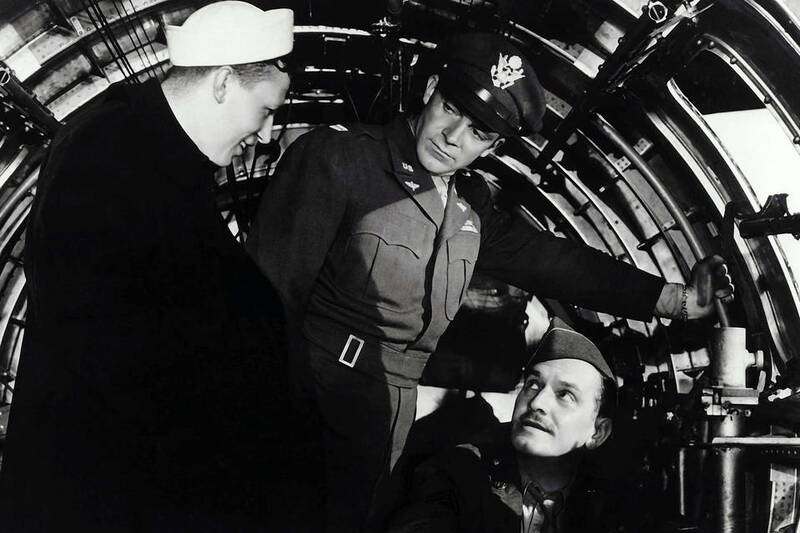 A scene from ‘The Best Years of Our Lives’ (1946) with, from left, Harold Russell, Dana Andrews and Fredric March. When the interview aired, a small Twitter community sprang up with people saying they too listen to movie music as they write, and asking what I listen to and offering recommendations. One suggested Ennio Morricone’s theme from “The Untouchables.” Yes—the rousing music when the cops mount horses to catch the mobsters at the bridge. When I hear it I always think: If I listened to this each morning, every day would be a heroic one. From @michaelkaplun came the soundtrack to “Rudy,” by Jerry Goldsmith—“a little fighting Irish inspiration.” “The Last of the Mohicans” was suggested by @Go_Beach. Someone put forth the score of “Out of Africa” by John Barry, someone else the “Patton” theme, again by the great Jerry Goldsmith. From an email friend came the song the soldiers sing after the Battle of Agincourt in Kenneth Branagh’s “Henry V.” Yes—a soulful, soldierly hymn. I want to mention a few I listen to a lot, and then get to something maybe deeper behind the music. I love Alex North’s score from the old Kirk Douglas movie “Spartacus.” It’s rich and varied. The music used in the scene of the freed slaves coming together in community and the love theme together remind me of the sweetness of life and the ever-present possibility of valor. Leonard Bernstein’s score for “On the Waterfront” is dramatic, crashing, tender—to me it speaks of cities. It, and the screenplay, reminds me of the importance of everyday human endeavor—that even if you think you’re just a beat-up nobody, a former contender with a one-way ticket to Palookaville, you can find within yourself a nobility you never guessed was there. An acceptance speech at a great national convention should sound like the score of “A River Runs Through It,” by Mark Isham, and like the end of Norman Maclean’s great book on which the movie was based: “Eventually, all things merge into one, and a river runs through it. The river was cut by the world’s great flood and runs over rocks from the basement of time.” Read those last words aloud. They are music. But for me, always, the greatest movie score, the one I listen to when I need it, is the most perfect pairing of story and music in the history of film: “The Best Years of Our Lives,” composed by Hugo Friedhofer. Three men coming home from World War II wind up by chance in the nose of a beat-up bomber, itself heading home to the junkyard. Suddenly at dawn, after a long night’s flight, they see America unfurling below them—the Midwest, and now Boone City, their (fictional) home. There’s the stadium where one of them played high school ball. There’s the bank where one worked. The music soars. I’m telling you, you hear in it: America. The men look down at what they’d left years before, and it’s still there, and they wonder what their lives will be like now, having been for so long and in so many ways so far away . . .
A left-wing cable anchor once told me he couldn’t watch that scene and hear that music and not cry. I said, me too. I think I’m admitting I listen to movie music not only because I love it and it helps the story along. I listen also for the reason a friend, a journalist, put his finger on when he told me of a setting he uses on Spotify. It plays the music he loves at the speed of his exercise: “It’s like it’s creating a movie soundtrack just for you. When I do this I feel like I should stop my run and save a kitten from a burning building, or make a certain speech on a tarmac before seeing my girl off one last time.” It rouses him. It takes him outside the dailiness we all live in and brings to mind the idea of valor. It reminds him of courage. Which, seen in a particular way, is another word for love. Movie music does that for me. It stirs me. It is derived from an American art form, film, and reminds me of the America I love as I do my work, which mostly deals with the daily muck of politics and culture, which is not always so lovable. The larger point, I suppose, is this: A year from now we will have chosen our new president. Which means we have just less than a year to get it right. We all need to be stirred. We need to know and believe the breakthrough is possible, the fight against the odds will end in victory, something good is just around the corner. We don’t need the drab, manipulative ideological arguments we so often get, and we don’t need the shaming that comes from so much of our political discourse—you’re insensitive, racist, sexist, check your privilege, quit appropriating my culture. We don’t need the two things we so often get from our government and its practitioners, the defensive whine and the impenetrable babble. There is a hunger to be reminded we’re all in this together, that this thing we’re all part of is, in fact, a great and noble project. We all want to be moved by the public acts of public men and women. We all want to be stirred by the soundtrack of the nation we love. We all want a leader who is equal to the music. I hope next Thanksgiving we will think perhaps we got one. A happy Thanksgiving weekend to the great and fabled nation that is still the hope of the world.